Management of orthopedic patients by region. There is a useful appendix section towards the back of the book which consists of; common medications, reference ranges for different blood tests, units of measurement and terminology, fracture eponyms and major movements of the body and the muscles acting on the joints. Overall this is a very comprehensive detailed book which provides a good overview of orthopedic management. At the beginning of the book it does outline the role of the physical therapist assistant but it is difficult to remember this is a book aimed at a physical therapist assistant due to the level of detail it goes into. For example it describes some of the assessment techniques that a physical therapist/physiotherapist may use. This information is useful for knowledge and understanding but possibly not within the scope of practice for all physical therapy assistant roles, as these practice rules vary from country to country. Looking at this book from a global perspective, it would be highly recommended for the student and newly qualified physiotherapy assistant looking to work within orthopedics. Designed to meet the unique needs of physical therapist assistants this book focuses on critical thinking and helps you apply fundamental orthopedic principles in physical therapy interventions. Clear explanations cover basic concepts such as the PTA’s role in physical assessment of flexibility, strength, endurance, and balance, along with the specifics of tissue healing; medications; gait and joint mobilization; and an introduction to biomechanics. It also describes the application of therapeutic interventions for many orthopedic conditions by region and affliction. 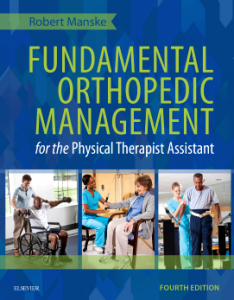 Edited by two experienced clinicians, Gary A. Shankman and Robert C. Manske, and written by contributors who are experts in their respective fields, this is your one-stop source for PTA practice in orthopedics.